American geologist , a professor at Yale, who was an authority on the geology of southern Nevada. 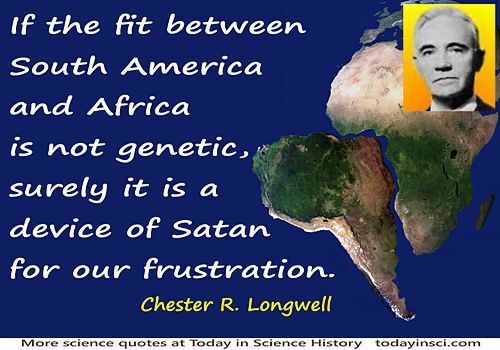 If the fit between South America and Africa is not genetic, surely it is a device of Satan for our frustration. Symposium paper, 'My Estimate of the Continental Drift Concept' presented at University of Tasmania, published in S.W. Carey, Continental Drift: A Symposium (1958), 10. Excerpted in Henry R. Frankel, The Continental Drift Controversy: Paleomagnetism and Confirmation of Drift (2012), 343. 15 Oct - short biography, births, deaths and events on date of Longwell's birth.